question_answer4) Count the number of cubes in the given figure. question_answer5) What is the least number of cuts required to cut a cube into 24 identical pieces? 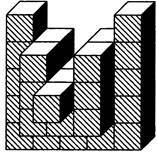 question_answer6) What is the maximum number of identical pieces a cube can be cut into by 7 cuts? question_answer7) Select from the alternatives, the box that can be formed by folding the sheet shown in figure (X). question_answer8) Directions: Observe the figure of a plane view of a cube and answer the given questions following it. Which face will be opposite to face "T" after folding a cube? question_answer9) Directions: Observe the figure of a plane view of a cube and answer the given questions following it. Which face will be at top if face "T" will be at the bottom? question_answer10) Directions: Observe the figure of a plane view of a cube and answer the given questions following it. Which two faces will be opposite to each other? Directions: A cube is coloured red on all of its faces. It is then cut into 64 smaller cubes of equal size. The smaller cubes so obtained are now separated. How many smaller cubes have no face coloured? How many smaller cubes have two surfaces painted with red colour? question_answer13) Which number is opposite to number 5? question_answer14) Which number of the face will be opposite to the face with number 3? question_answer15) Find the number on the face opposite the face showing 6.
question_answer16) Which alphabet is on the surface opposite to the surface on which alphabet U appears? question_answer17) Three positions of a dice are given. Based on them, find out which number is found opposite the number 2 in the given cube. question_answer18) When the digit 5 is on the bottom then which number will be on its upper surface? question_answer19) If the total number of dots on the opposite of a cubical block is always 7, then find the figure which is correct..
question_answer20) On the basis of the following figures, identify the number which comes in the place of X.
question_answer21) When number 1 is on the top, what number will be at the bottom? question_answer22) The six faces of a dice have been marked with alphabets P, Q, R, S, T and U respectively. This dice is rolled down three times. The three positions are shown in the figure below. Find the alphabet opposite P.
question_answer23) When number 1 is on the top, what number will be at the bottom? question_answer24) Find the number of dots on the face opposite the face bearing 3 dots. question_answer25) Which sign will be opposite to '+' ? question_answer26) A cube on whose faces letters have been written, is shown below in different positions as can be seen from different directions, find the missing letter. question_answer27) If 1 in a dice is adjacent to 2, 4 and 6, then which of the following statements is necessarily true? Directions: In each of the following questions, select the correct option. Which number is opposite to number 4? Which number is opposite to number 2? Which number is opposite to number 6?